This peak earns its name with its pointed peak. An Starraicín is the 700th highest place in Ireland. Who is this smiling man? Way back in April 2010 I was sworn to secrecy by this man. Why you may ask. Well he doesn't know the third secret of Fatima and he didn't help America fake the moon landings. His name is Adrian Hendroff and he had invited me on a walk that was to feature in his book "The Dingle, Iveragh & Beara Peninsulas : A Walking Guide"( in the shops now by the way).It featured a quartet of sub 500 meter summits east of Dingle and to tell the truth I wasn't expecting much. Oh was I wrong. Magnificent, distinctive peaks seldom seen and seldom mentioned bypassed for their more famous neighbours. 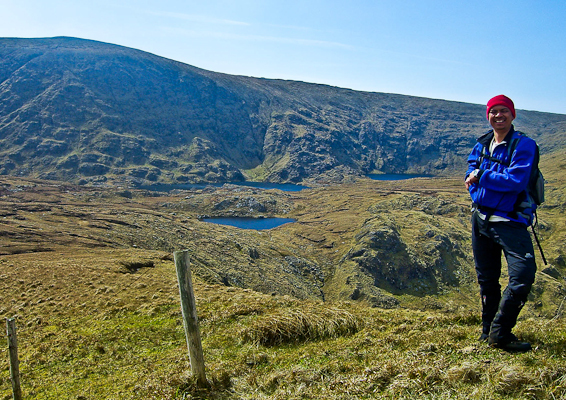 If you get here on a clear day you will be the happiest hillwalker in Ireland.